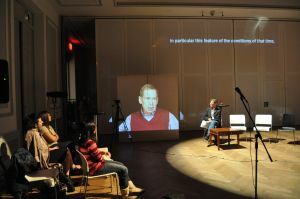 The Archa Theatre successfully presented its production of WINDOW OF OPPORTUNITY in New York on Tuesday, November 10. 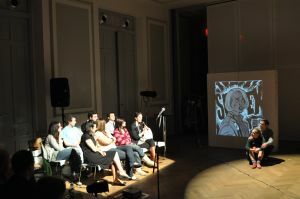 The multimedia project, the Archa Theatre’s contribution to the 20th anniversary of the political changes in 1989, was an enormous success with the audience, who filled the large hall of the Czech National Building to capacity. 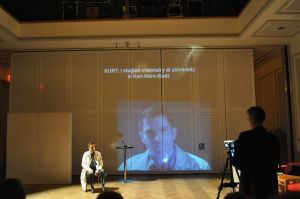 In addition to Eva Hromníkova and Philipp Schenker the performance featured American actor and member of the SITI Company Tom Nelis as the host of the fictitious radio station 89FM. Taking part in the debates which are part of each performance were former dissident and Czech ambassador to the UN in New York Martin Palouš, literary critic and historian Martin C. Putna and John K. Glenn a representative of the US Global Leadership Coalition and a professor at George Washington University. 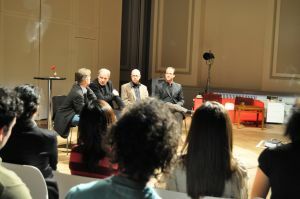 Václav Havel and Jacques Rupnik appeared in video performances. 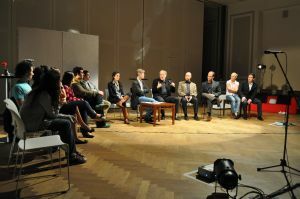 Representatives of the young generation were also involved in the project – 12 students from American universities (mainly NYU) who were born in 1989. 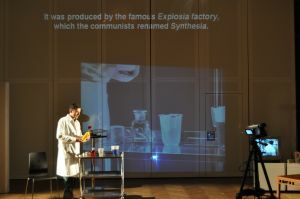 The performance was directed by Jana Svobodová.